Some might describe it as the genius of capitalism; the ability to adapt on the fly according to the circumstances. Hence the drive to technological fixes in alternative energy generation, storage, and distribution. While the existential threat to the species is a clear and present danger, capitalism's ability to adjust is subject only to the limitations of the human mind. We should all sit up and pay attention when Naomi Klein and Mark Carney, two of Canada's foremost world citizens, are on the same page. Klein has written a well-argued and well-researched book entitled "This Changes Everything: Capitalism vs. the Climate." Her core premise is that climate change will shake capitalism to its foundations and compel those of us in the West to change how we do business. It is a thoughtful, and for some, a compelling argument. Clearly there are elements of truth in her analysis. Carney, the Governor of the Bank of England, has warned fossil fuel companies that they cannot burn all their reserves if the world is to avoid catastrophic climate change. Speaking at the World Bank, he encouraged businesses to include environmental impacts in their reports so as to help "influence the allocation of capital and credit." It may well be that a "prophet" and a "capitalist" are seeing the same thing. However, it is unlikely that Western societies will drop capitalism any time soon, even in the face of an existential threat. There are at least two reasons why this is the case. The first is self-interest. Even if the herd is heading pell-mell to mass oblivion, the instinct to look after number one is overwhelming, and some might say paramount. Self-preservation focuses the mind like nothing else. "As long as I'm OK, then let the others take care of themselves." It may not be noble, but it works. It motivates us all to keep food on the table, clothes on our backs, and a roof over our heads. Secondly, while the instinct to self-preservation may be powerful, even dominant, it is not stupid. Changing course to survive is a rational decision. The intellectual and moral underpinnings of capitalism may be dubious to some, but there is a reason why it is still the reigning ideology. Klein may well be right that the threat of climate change will require a level of international cooperation seldom seen in history. The Montreal Protocol of 1976 is one such example and has, by accident or design, removed more GHGs from the atmosphere than any other single initiative. However, the Montreal Protocol is child's play compared to the cooperation required to limit GHGs to a two-degree rise in temperature. But to pin our hopes for a realistic, verifiable and enforceable climate change plan on embracing cooperative socialism is a bridge too far for most Western societies. For some, the attraction of living in a socialist workers' paradise is overwhelming. Regrettably, we have no examples of large-scale cooperative societies that can be described as a success. Both Russia and China have largely abandoned a command and control economic model for a hybridized version of state capitalism which retains central political and military control, lets crony capitalism run wild, and pays little or no attention to the demands of the planet. If either of these countries are perceived to be alternatives to Western capitalism then we are much closer to extinction than previously thought. While neither Russia nor China appears to be an attractive alternative model, it does not follow that Western societies are immune from gross stupidity. Take Canada for example. The Harper Government™ has made an all-in bet on the oil sands. Every public policy initiative is viewed through the prism of what's best for Alberta's vast bitumen resources. Ignore for a moment the foolishness of not making our Copenhagen targets, even when it is demonstrable that it is in the interest of oil sands development to vigorously pursue reductions in GHG emissions. Ignore as well that betting on one economic driver means that others get side-swiped, for example, the manufacturing sector in Ontario and Quebec. The business pages are full of stories about the huge market corrections happening as a result of a number of worries: Ebola, ISIS, Putin, etc. This is also true of climate change. The market is driving down the viability of some oil sands projects to the point where they may have to be scaled back or abandoned altogether. There are too many moving parts to determine the impact on our GHG emissions, but it would seem reasonable to conclude that the upward trajectory of oil sands emissions may well be bent to lower and slower growth. If, by some miracle, we meet our Copenhagen targets, it may well be in spite of Harper Government™ policies, and not because of them. The drop in production, the discounted dollar, and the reduced tax revenues that go with it have exposed the Conservative "Energy Superpower" strategy as foolish. It would have been helpful had the Harper Government™ actually considered the economic consequences of a volatile petro dollar and the negative economic knock-offs associated with their lack of GHG policies. Mr. Harper has no Plan B. It is never wise to put all your policy eggs in one basket. While one might lament the instability or unwillingness of the world's citizens and their respective governments to do "SOMETHING" about climate change, would it not be highly ironic that the "market" might actually do more to curb Canada's GHG emissions than any government initiative? After all, a market-driven technological revolution will enable the United States to meet its Copenhagen targets, not Congressional initiatives or the oratory of President Obama. The "market" may actually play a role in rebalancing the Canadian economy to a more sustainable basis and enable the country to get closer to its Copenhagen targets. 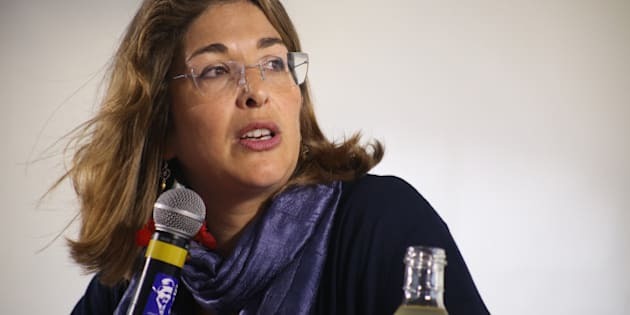 All of which is to say that Naomi Klein is right to identify the problem of rampant emissions, but she is wrong to overlook the "market" as a self-correcting mechanism. Self-preservation is a wonderful corrective, even if it operates in mysterious ways and in a moral vacuum.